When I initially pitched the idea to Nobox, my concept was something like a triptych (quadtych?) that showed all the previous beta pages. Fortunately, they had the much better idea of combining the existing art with something new and even more grandiose, in the style of the classic Drew Struzan movie posters. 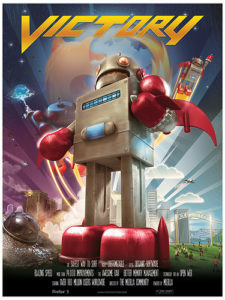 From there, we ran with the movie poster concept, right down to the “Rated O for Open Source” tag at the bottom. * For a behind-the-scenes look at the early stages of the poster, check out the initial concept sketch. 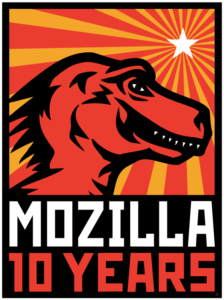 * Currently the www.firefoxvictory.com URL points to the main Firefox download page, but I have a few ideas for turning it into a more participatory robot-related site. Stay tuned! 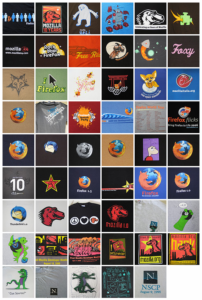 * Lastly, here’s a Flickr set of the entire series of Firefox 3 robot art.